Despite the extensive loss of productive soils and the valuable ecosystem services that soils provide, the awareness of the magnitude and negative implications of these processes remain relatively low. In this RECARE policy brief, Ecologic Institute's Sandra Naumann and Ana Frelih-Larsen together with Gundula Prokop from the Austrian Environment Agency illustrate the scale of the problem and identify ready-made solutions and steps policy makers and practitioners can take across different levels, from city planning to national and European level. The RECARE policy brief is available for download. 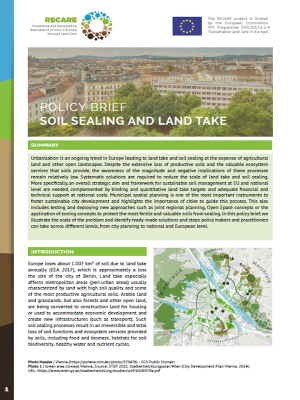 Urbanisation is an ongoing trend in Europe leading to land take and soil sealing at the expense of agricultural land and other open landscapes. Systematic solutions are required to reduce the scale of land take and soil sealing. More specifically, an overall strategic aim and framework for sustainable soil management at EU and national level are needed, complemented by binding and quantitative land take targets and adequate financial and technical support at the national scale. Municipal spatial planning is one of the most important instruments to foster sustainable city development and highlights the importance of cities to guide this process. This also includes testing and deploying new approaches such as joint regional planning, Open Space concepts or the application of zoning concepts to protect the most fertile and valuable soils from sealing. Naumann, Sandra; Ana Frelih-Larsen and Gundula Prokop 2018: Soil Sealing and Land Take. RECARE Policy Brief. Ecologic Institute, Environment Agency: Berlin, Vienna.